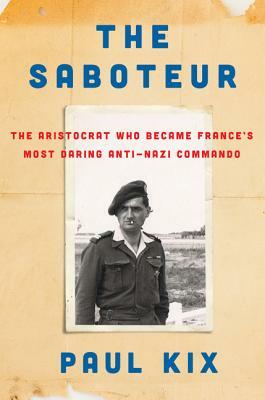 In the tradition of Agent Zigzag comes this breathtaking biography, as fast-paced and emotionally intuitive as the very best spy thrillers, which illuminates an unsung hero of the French Resistance during World War II—Robert de La Rochefoucauld, an aristocrat turned anti-Nazi saboteur—and his daring exploits as a résistant trained by Britain’s Special Operations Executive. Paul Kix is a deputy editor at ESPN the Magazine. His work has appeared in the New Yorker, GQ, New York, Men’s Journal, and the Wall Street Journal, among others. He lives in Connecticut with his wife and children. “[The Saboteur] is very engaging. [Kix] moves quickly along, striking a good balance, with tangential explanations when needed. He builds and maintains a sense of Rochefoucauld’s ever-present fear of betrayal and capture. He does not gloss over the complicity of most of the French people, nor does he spend inordinate time railing against them. His focus in the biography is the courage, luck, skill, and determination of a freedom-loving Saboteur.